The Barn at Primo is situated a top the green hills of our private, four acre, organic farm on the beautiful Mid-Coast of Maine. James Beard Award winning Chef, Melissa Kelly and the extraordinary staff at Primo look forward to hosting your friends, family, guests and colleagues and providing you with a true Farm-to-table experience. You will have the unique opportunity to see firsthand the love, time and commitment that goes into everything we do here. You will enjoy first class service, incredible food and all of the best Primo has to offer. Walk through our lush, organic gardens while enjoying one of our signature cocktails. Savor exquisitely prepared appetizers in comfortable outdoor seating areas. 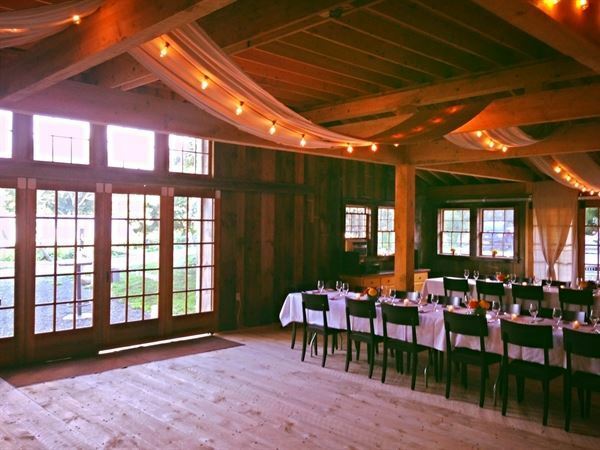 Gather with your party in our beautiful post & beam barn. In addition to weddings, we welcome rehearsal dinner parties, corporate groups and a multitude of other gatherings. We look forward to working with you and helping you to create the perfect event. The basic venue rental fee is $3500 and intended for up to 75 guests only. The basic rental fee includes standard white linen tables, chairs, glass, dinner & flatware. Parties exceeding 75 guests and requiring outdoor seating for dinner may incur additional venue fees. Please inquire about reduced rental fees in May, June, November & December. All tents must be approved by PRIMO are the sole financial responsibility of the client. Please contact us for complete terms & conditions.